I’ve seen three of the past four shows presented by Utica College’s Department of Performing and Fine Arts. Neighborhood 3: Requisition of Doom (Spring 2013), Cinderella Waltz (Spring 2014), and now The Laramie Project: Ten Years Later (Fall 2014). Neighborhood 3 and Cinderella Waltz were harmless enough, although not very good – both were sophomoric in-jokey comedies that featured actors running up and down the aisles, incoherent lighting and sound, and (surprisingly) above average sets. Both shows left the impression that one might have better enjoyed them drunk or stoned. UC’s most recent production is in a different league; it’s an act of theatrical malpractice. The Laramie Project and this sequel were conceived and written by a group called Tectonic Theater Project, under Artistic Director Moisés Kaufman. 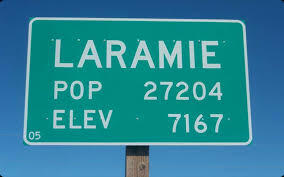 The group traveled to Laramie, Wyoming to interview students and residents regarding the 1998 murder of gay University of Wyoming student Matthew Shepard. The material was shaped into two plays – one, which premiered in 2000, reflected the aftermath of the tragedy. The epilogue, as it’s referred to by the group, was introduced in 2009. This is dangerous business. Filmed documentaries can be problematic because although they feature interviews and other primary sources, a director shapes the narrative using cinematic tools such as lighting, sound, and particularly editing. A theatrical event such as The Laramie Project presents itself as documentary, except its portrayals are further modified by the actors conveying the performances. What might be merely didactic on the page can easily slip into propaganda depending on the actor’s, as well as the director’s choices. I assume none of the performers in the Utica College production based their interpretations on firsthand knowledge of the people whose words they repeated. I further assume they are all well-meaning people who legitimately want to “hold up a mirror to society.” I’m not sure they realize the extent to which they stacked the deck. Take the classic English teacher’s example, a sentence that can mean different things depending on how it’s said: “I never said she stole my money.” Now apply that to The Laramie Project’s interview snippets, as recited by actors with obvious sympathies. The agenda in the piece is obvious to begin with, then it’s oversold, and the viewer longs for the company to give the town a break. Points are scored, then repeated ad nauseam – by the tenth incredulous repetition that Shepard wasn’t killed in a robbery gone wrong, I was ready to stipulate it was a hate crime just to get the actors to shut up, already. I’m a gay-loving social liberal and I left the theater wanting to send Laramie a big consolation hug. This “theatre for social consciousness” threatened to undo mine. Tectonic brags on their website how their shows have changed hearts and minds, but I find it difficult to fathom – they’re preaching to the choir and condescending to everyone else. To wit, the scene early on where a clueless University of Wyoming student is “interviewed” by a Tectonic company member. The interviewer can’t believe the student isn’t doing more to commemorate the anniversary of Shepard’s death, and the actor portraying the student acts dutifully clueless instead of telling the Tectonite to buzz off. Laura Salvaggio’s set was impressively wacky, recalling the Guardian set piece in the classic Star Trek episode The City on the Edge of Forever. An irregularly shaped stone frame contained a video screen, which was used for subtitles and sometimes video clips. Unfortunately, actors were routinely blocked downstage of the screen when it was displaying information, so I missed a lot. Mike Diederich’s lighting made little sense – a telephone conversation between two characters might have one in blue light and another in pink, but I couldn’t figure out why. Actors sometimes delivered entire scenes standing half in and half out of a spotlight (I don’t think it was metaphorical.) I’ll allow that it might have been operator error – the running crew maintained a lively conversation in the booth that was sometimes louder than the actors. Between the somber, repetitive scenes, various performers sang a capella verses of Amazing Grace while a dancer contorted around the set. It was absolute cliche, also bizarre and mystifying. Who is the amazing grace for, and what does the dancer represent – Matthew Shepard? The residents of Laramie? The audience? God help us all, we could have used it. Posted in Theater and tagged Theater, Theater Reviews, Utica NY Theater. Bookmark the permalink. I’ve heard it said that one man’s freedom fighter is another man’s terrorist. I’m guessing you’ve heard that line too. So I suppose it’s equally valid to say that one playwright’s socially relevant work is another’s propaganda. And in both cases, the victors get to write the history. I too am a social Liberal. But I would much rather listen to Conservative William F. Buckley than to Air America radio. The politics presented by Air America were more in sync with my own sentiments. But with Buckley, the quality of discourse was much much higher. And as you’ve more-than-suggested here, when artistic ‘discourse’ is lacking, so is its intended experience. Paul, no denying the quality of your discourse. I struggled to write this, because I didn’t think I was finding the right language to describe how the play was having an opposite effect on me from its intention. That’s the malpractice. But you received that message – thank you for commenting. I haven’t listened to Air America radio, but I share your feeling that a well-delivered message can be more enjoyable than simply having one’s views confirmed by trash. © Chris Bord and Moss Island LLC, 2018. Unauthorized use and/or duplication of this material without express and written permission from this blog’s author and/or owner is strictly prohibited. Excerpts and links may be used, provided that full and clear credit is given to Chris Bord and Moss Island Sounds with appropriate and specific direction to the original content.